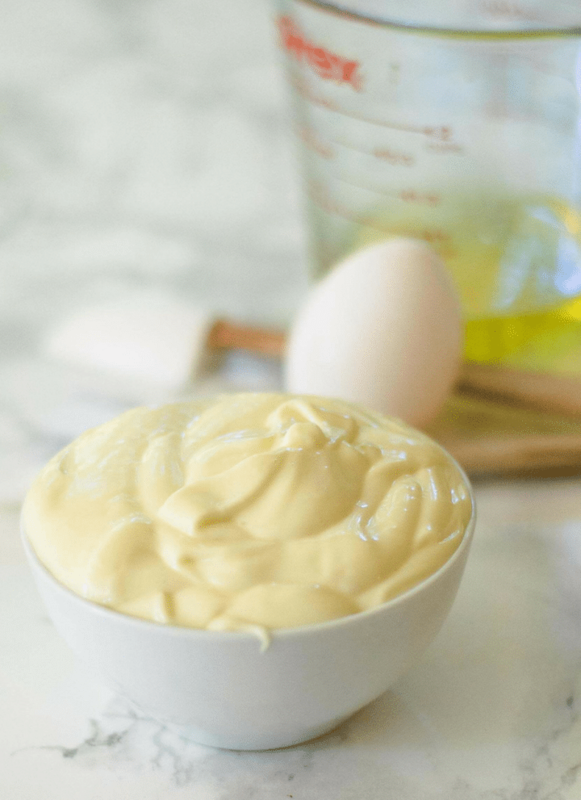 2-Minute Homemade Mayonnaise. Only 4 Ingredients! Making your own homemade mayonnaise is simple, takes only a couple minutes, and uses only 4 ingredients. I’m not a condiments person. I think it’s the result of growing up as a picky eater. If mayonnaise, ketchup, mustard, or salad dressing touched my food, my meal might as well be sewage on a plate. As I’ve aged and my palate has expanded, I have an appreciation for condiments. More often than not I still forget to add them to my food, but the smell of them no longer makes me gag until my mom finally lets me leave the table. Mayonnaise (also known as mayo) is a sauce made by an emulsion of eggs with an acid (usually vinegar or lemon juice) and a neutral flavored oil. It is blended or whipped until the oil is broken down into tiny particles that remain suspended in the egg yolks to create a thick, creamy mixture that is mild in flavor. This makes a perfect accompaniment to many dishes because it has a desirable texture and just a hint of flavor. Not technically a Mother Sauce, mayonnaise is the foundation for many other dressings and sauces, including: Ranch Dressing, Thousand Island Dressing, and Tartar Sauce. Mayonnaise ranges in many colors from white to yellow. This is impacted by the ratio of egg to oil, as well as the type of oil used. When you eat at a higher-end restaurant you may find the absence of mayonnaise on the menu. Instead, you see the word aioli. “What exactly is the difference?“, you ask. Two ingredients; mayonnaise has vinegar and aioli has garlic. Both have the same thick, creamy texture and are excellent at gluing together a burger, but aioli sounds fancier (similar to USDA beef labeling). “Why would you choose one over the other?”, you may be wondering. Mayonnaise is commonly used as a condiment that is great for accenting a dish, while aioli has a stronger flavor. If someone were to serve you a vegetable platter and tell you that it had mayonnaise as a dipping sauce, would you eat it? Probably not. The idea of mayo as a sauce gives most people grossed-out shivers. The strong garlic flavor of an aioli is more likely to be accepted as a sauce. If you don’t have the aid of an electric and would like to make your mayo by hand, you can use a bowl or a mortar and pestle to do the job. Simply follow the same instructions as above, but use 2 egg yolks instead of a whole egg, and whisk as quickly and vigorously as possible. This will help break down the oil into the smallest particles possible. The smaller the oil particles, the better the chance of maintaining your emulsification and keeping your mayo in tact. No one likes to eat food that has gone bad. To prevent this happening, use the freshest eggs possible and keep your mayo in an air-tight container in the refrigerator for up to one week for best results. The acid in the vinegar or lemon juice may help kill off bacteria in the egg initially, but will not prevent bacterial growth afterwards. If you are feeling risky, you can subscribe to the notion that your mayonnaise is good for as long as your eggs are good. In that case, you can store it for up to three weeks (at your own risk!). Making your own mayo is super simple – especially if you have a blender, food processor, or immersion blender. If you don’t have one of these, you can still make your own mayo using a good old fashion bowl, whisk, and muscles. Don’t have a blender? You can make your own mayo using a handheld or stand mixer with the whisk attachment on a high speed. Just be careful not to lift the attachment out of the mayonnaise while it’s on or your might get yourself a little saucy. Just like with making Hollandaise Sauce, the key to a great mayonnaise is a slow and steady stream of oil (see picture above). Once your emulsion is set, you can add your oil in greater quantities, but keeping it nice and even will help ensure your mayo doesn’t separate (also known as “breaking”). If your mayonnaise separates, remove it from your bowl and set the broken mixture aside. Clean the blender or food processor and dry completely. Add in one egg yolk and slowly drizzle in the broken mayonnaise mixture until recombined. Get the free printable grocery list for this 2-minute homemade mayonnaise recipe HERE. This grocery list has everything that you’ll need to make this Homemade Mayonnaise recipe. To help in making grocery shopping simple, each ingredient is listed in easy-to-find grocery store amounts. If there is no amount specified, that means that you can buy the smallest (or largest) container available and still have plenty left over. Now that you are an expert mayonnaise maker, here are some recipes to help you use up your supply before it goes bad. Though not technically a Mother Sauce, mayonnaise is the foundation for many sauces, dips, and dressings. Mastering a homemade mayonnaise will give you better control over flavor, and the slightly tangier flavor will make you a homemade mayonnaise convert. In the bowl of a blender or food processor, add the egg, salt, and lemon juice (or vinegar). Turn your blender or food processor to a medium-high speed and start incorporating your oil in a slow and steady stream that is slightly more than a drizzle. Continue slowly adding the oil until it is completely combined and the homemade mayonnaise is thick and holds it's shape. If your homemade mayonnaise is too thin, continue adding extra oil until it reaches your desired consistency. If it is too thick, add additional vinegar or lemon juice to thin it out.